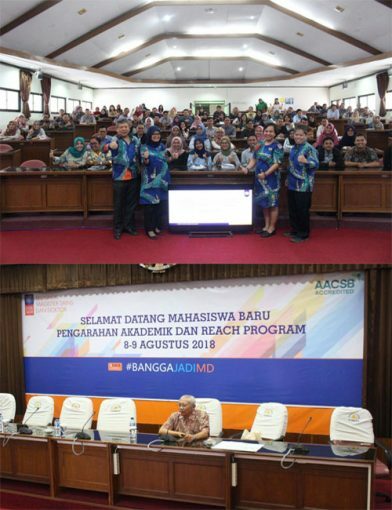 In August 8th 2018, Master of Science and Doctorate program of FEB-UGM conducted an academic briefing for 61 new students in both levels, the event was held at the Auditorium of BRI in MD FEB-UGM building. The academic briefing were started and leaded by RR. Tur Nastiti, Ph.D. as a Manager in Academic, Students Affair, and Partnership of MD FEB-UGM. The three directors of MD FEB-UGM (e.g. Professor Jogiyanto Hartono, Ph.D., Professor Dr. Catur Sugianto, and Nurul Indarti, Sivilokonom Cand Merc., Ph.D.) were also taking part in giving brief explanation about MD FEB-UGM and specifically related to each program in it. Professor Jogiyanto Hartono., Ph.D represented the MD FEB-UGM program in welcoming the new students. In his speech, Professor Jogiyanto Hartono, Ph.D explain the value of FEB-UGM, which are: integrity, professionalism, objectivity, academic freedom, and social responsibility. Furthermore, Professor Jogiyanto Hartono, Ph.D also presented the mission, learning goals, learning objectives, and the curriculum for the six programs under the MD FEB-UGM. Professor Jogiyanto Hartono, Ph.D closed his speech by emphasizing that MD FEB-UGM students should have an impact to the society by holding on the values of MD FEB-UGM. Secondly, Nurul Indarti, Sivilokonom, Cand. Merc., Ph.D. explain the general academic rules of MD FEB-UGM, such as the credits and courses for the six programs. Furthermore, Nurul Indarti, Sivilokonom, Cand. Merc., Ph.D. also explain about tips and tricks to be a success student in MD FEB-UGM, by starting her presentation with quoting a valuable message from Brian Herbert, who said “the willingness to learn is a choice”, and adding that every choices has it own consequences. When a person choose to enter the MD FEB-UGM program, so he/she became labeled as a tough person, full of curiosity of science, and a fighter of science. Therefore, the students should contemplate deeply about his/her choice to join MD FEB-UGM program, so then they will settle their study well. “Strengthen your intentions, straighten your intentions, and study hard” are the closing statement and message of Nurul Indarti, Sivilokonom, Cand. Merc., Ph.D.
Thirdly, Professor Dr. Catur Sugianto presented about the campus life in MD FEB-UGM program, he explain about research part of MD FEB-UGM which had been in collaboration with other universities in overseas, as well as the academic part which had many collaboration such as dual program. Professor Dr. Catur Sugianto also emphasize that the FEB-UGM lecturers are highly competent in both lecturing and research, so it would be a waste if students are not optimally exploit the chance studying with them. In his last presentation, Professor Dr. Catur Sugianto also emphasize the importance of knowing each other and sharing knowledge activity in students community to generate a broad, comprehensive, and beneficial idea in terms of science.